Having very little prior health or healthcare background, the best preparation for my current role came from learning how to be entrepreneurial. I learned an enormous amount as the co-founder of several software startups serving the nonprofit sector. Being part of the leadership team at TechSoup Global, expanding to 32 new countries and launching a new service for international grantmaking gave me an incredible window into corporate and private philanthropy. What are the most important health issues in your community? Among the most important that Empire Health Foundation has prioritized include mental health, Adverse Childhood Experiences (ACEs), and health care access and transformation. What are your core strategies for addressing these health issues? In short, an approach we like to call “Philanthropy 3.0.” Where v1.0 is “feel good” responsive shotgun grantmaking. And v2.0 is having a complex theory of change, but still “writing a grant check and hoping.” V3.0 is setting a concrete target and “doing whatever it takes” to move the needle with our partners. Another core strategy is to replicate “bright spots” that have succeeded in moving the needle in other states. To implement v3.0, we have formed new public-private collaborative entities or subsidiaries, in others our program staff are “troubleshooters” helping to solve road blocks with our partners on a constant basis. For example, one collaboration helped reduce the uninsured in our community from 13.1% to less than 3%. Another initiative has catalyzed 10 school districts to switch to healthy scratch cooking, which will cover 4 million meals a year by 2017, and our first district has seen a steady 8% improvement in childhood obesity rates. In another collaboration, after 20 years of stagnant levels, we have increased the pipeline of primary care providers by 40%. Most recently, a partner district in our ACEs initiative has reduced out of school suspensions in the target mainstream high school by 50% so far year to date. As a foundation with an explicit mission to serve a community, how do you include that community as an integral partner in your work? All of our initiatives are co-designed and co-invested in by our communities and partners. We bring startup funds, we bring “bright spots” to consider replicating, we mitigate the financial risk of policy and systems change, and we help them troubleshoot and adapt. But our partners are the ones who are making these tough systems and policy changes, we can’t move the needle without them. Some would argue that we are not directly connected to the community as a result, and that would be fair. Because of our bold goals, and focus on sustainable systems change, we do tend to build deep relationships with anchors in the ecosystem at some expense of building direct community relationships with the families who live in our region that we ultimately serve. What’s been a recent big success for your organization and what excites you about it? Some of the most exciting movement is happening in our ACEs initiative. As I mentioned above, through ACEs training for teachers and other policy changes, our partner school district has reduced out of school suspensions by 50% so far this year. I am incredibly excited not just at the measurable outcomes, but the resiliency and learning of the partnership after some setbacks last year. In addition for ACEs, we are trying to replicate a “bright spot” strategy that could safely reduce the number of kids in foster care by 50%. Just two weeks ago, our anchor partner in that work was able to acquire a dream real estate property that is instrumental to that bright spot strategy. Our goal is to launch it in 2016, after two years of groundwork, so I am incredibly excited with this milestone and hope to see our first needle move in 2017. What’s the single biggest challenge your organization is tackling right now? Our single biggest challenge we are tackling is incubating the first Network Administrator in Washington state, whose purpose is to implement performance based contracting (PBC) for the child welfare sector. PBC represents a significant systems change for how services are paid for and delivered for foster care kids and families. It’s really hard to go from being the “popular” funder, to taking hits from multiple stakeholders unhappy with the systems change and with your particular approach. However, if private health foundations can’t take that risk to persevere while unpopular, then who can? Already we are seeing the potential for early wins. Say for example, the average no-show rate for a family support service is 10%, and provider A has a 20% no-show rate and provider B has a 1% rate. We could help spread the specific best practices of the veteran provider so that both have 1% rates. This saves money, improves efficiency and hopefully results in better outcomes for children and family who are receiving the needed services. What are the most important public policy issues for you this year, and what are you doing about them? The biggest one right now is the potential Medicaid waiver for Washington state. This is the perfect storm of our Healthcare Transformation initiative intersecting with so much of our other philanthropic work. EHF has quite a few collaborations at the state and regional level to work on both the process while the waiver is being considered, as well as developing strategies should the waiver be approved. 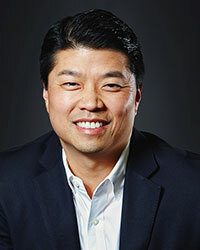 Antony Chiang is CEO of the Empire Health Foundation, joining us this month for our virtual roundtable with healthcare conversion foundation leaders.